Brisbane is the capital city of Queensland. Queensland as a whole is known for its laid back and slower lifestyle compared to the other East Coast major cities. It is the 3rd largest city in Australia with a population of approx. 1.75 million people. Queensland is the fastest growing state in Australia with migration from the Southern states as well as from overseas. With its constant growth in population and popularity, Brisbane has become a much livelier city than Sydney and Melbourne with a cosmopolitan mix which has expanded the night life, restaurants and cultural events throughout the year. Brisbane is central to other great places in Queensland including the Gold Coast (approx. 1 hour drive south of Brisbane) and the Sunshine Coast (north of Brisbane). The Gold Coast is a favourite tourist spot as it is home to four theme parks including Warner Bros Movie World and Sea World. The temperature ranges from 15 – 30 degrees with occasional highs of 35 degrees. It has a more tropical feel due to Brisbane being close to the Tropic of Capricorn and as a result is a popular tourist and holiday location for Australians and visitors alike. 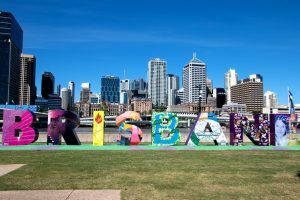 Brisbane has a full range of occupations just like any other large progressive city, but because of the overall skills shortage throughout Australia, Brisbane is not immune from shortages, which allows emigrants to find employment relatively easily. Each of these websites provide a plethora of information for people looking for work including tools to research specific employers, education and training, self employment opportunities and a whole lot more. The Education system in QLD has public (Government) and private (fees paid by parents) schools. There are a large number of child care facilities, pre-schools, pre-prep schools, and then years 1 through to 12. There are private colleges, TAFE colleges, Griffith University as well as other performing arts facilities. Housing ranges from $125,000 for a 1 bedroom flat to $350,000 for a 3 bedroom home and up to $1Million plus for a home with 6 or more bedrooms. Brisbane is quite hilly in sections which give both views and varieties, but the beach suburbs are well sought after and prices are inclined to be of greater value in these areas. If you are looking to rent in Brisbane or surrounding suburbs, the average price is $360 per week where the Gold Coast and Sunshine Coast rents are approx. $380 – $420 per week. Queensland Transport is the body leads the future direction and development of the transport system in Queensland. It is through this government body you organise your driver’s license, boat license and obtain the information on driving rules and laws in Queensland. The local government is part of the Department of Infrastructure and Planning and is responsible for a wide range of local issues including council rates and local laws as well as being accountable for coordinating a range of programs and services for the local community. You will never be bored in Queensland! The Queenslanders are spoilt for choice of amazing attractions and things to do and see. With QLD being such a vast state, I have concentrated on providing you information for the southern part of QLD which is made of the Gold Coast, Brisbane and the Sunshine Coast. Off the coast of Brisbane, there are many islands which are popular with tourists and locals alike including North Stradbroke, Bribie Island and Moreton Island. There are day trips available as well as longer stay trips to allow more discovering of the fauna and flora and pristine beaches. Depending which island you visit, you have the opportunity of swimming with dolphins, relaxing along the pristine sands of some of the world’s most beautiful beaches and much more!